The meek lamb has not turned into a roaring lioness...except...on those occasions when she feels the necessity of "straightenin' out the world" with some "sane advice". If there is any subject on which there exists a shadow of doubt or uncertainty, your quest for wisdom and truth has ended. 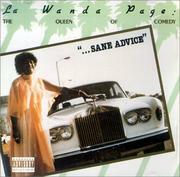 You have to listen to this performance...this "advice" is indubitably "sane".